But Chrome has one huge disadvantage compared to basically every other browser out there: Really, REALLY awkward bookmark handling. And this is completely unnecessary. Let us explain… and propose a solution. Not everyone uses bookmarks (a.k.a. favorites) a lot, but many do, and through the years a certain set of “best practices” have been developed by browser makers and users alike, specifically the ability to have a bookmarks sidebar that can be used for viewing, adding and opening bookmarks in a simple fashion. Chrome almost has this, but has somehow completely missed the target. Open the “bookmark manager” in Chrome and you’ll be met by something like what you see here below. That’s the closest thing to a sidebar you get, but as you can see it monopolizes an entire tab. There simply is no sidebar. Chrome also has a bookmarks bar, seen in the screenshot above, but that’s simply not good enough, especially if you have your bookmarks in a tree structure (or have a lot of them). It’s impossible to get a decent overview of your bookmarks this way, and there are other usability issues, like having to wade through the directory structure for every single bookmark you want to open. Why a sidebar? With a proper bookmarks sidebar, users would be able to have it visible all the time if they so pleased, easily adding bookmarks by dragging and dropping tabs to the right place in the sidebar. Not to mention the great overview of and easy access to bookmarks this provides. This lack of a bookmarks sidebar simply makes Chrome less useful, and for many people it’s a dealbreaker. Google, we love that you’re innovating and pushing the envelope with Chrome. However, in this specific case, your solution for handling bookmarks is inferior to that of your competitors. It simply is less useful, not to mention clumsier. It doesn’t have to be this way. Whatever you do, add a proper bookmark sidebar that actually lets users browse with the sidebar visible, and let them easily open and add bookmarks (with drag and drop). We have lost count of how many times we’ve heard people say that the ONLY thing preventing them from switching to Chrome is its lack of a proper bookmarks sidebar. And it’s not just us. Frustrated users have been raising this issue in various forums for Chrome for quite some time now, seemingly with no response at all from Google. Bookmarks are a fundamental concept to web browsers and not having the best possible support for them is a handicap. Since there are already good practices in place for how to handle bookmarks, no browser maker should need to worry too much about how to handle them. We don’t mind innovation (in fact, we love it), but in this case Google has made something much worse than it needs to be. And with Chrome at version 6, it’s quite frankly a bit baffling to us why this has not yet been addressed. It should be in Google’s best interest to fix this, and we are convinced it would make even more people switch to Chrome as their primary web browser. Agree? Disagree? Please feel free to add your opinion in the comments. To be honest, I don’t miss having a bookmarks sidebar at all, and I love the way I can have just a handful of useful links in a tiny area across the top of the screen, out of the way. People who browse with their bookmarks bar open drive me insane! So much clutter! 1- I always have google reader, twitter, and gmail open in tabs, so I don’t have them bookmarked. 2- I am led to most of the sites that I go to regularly (blogs, webcomics, gamedev.net etc) through RSS, so I don’t have them bookmarked. 3- For sites that I do go to frequently, I’m often searching for something (youtube, wikipedia), so I just search straight from the address bar. I was going to type my query anyway, so hitting “y, tab” doesn’t add any effort. 4- I read google news from my phone while on the train. In short, I navigate the web in different ways, barely using traditional bookmarks at all. I have a total of 6 sites on my bookmarks bar, plus another 5 under a single folder. I then have another few under ‘other bookmarks’ which are specific pages with info I might want at some undetermined point in the future. I’m not sure I agree with this. Chrome’s bookmark manager should not be confused with the drop down menu that appears when clicking on the subtle bookmarks link. I’m not at my computer, so I will have to confirm this later. Actually you can place the folders from your bookmarks on your top bar, it acts the same way. Hit ctrl+D and you can tell chrome where to put the new bookmark. So, technically it’s the same thing just doesn’t function exactly the way you’re asking. @Dcp3450: Chrome’s bookmarks bar (toolbar) most definitely doesn’t act the same way as a bookmarks sidebar, not even close. It’s a different kind of functionality (case in point, Firefox has both a bookmarks toolbar and a bookmarks sidebar). @AgentScribe: See the answer above. Of course, this is all a completely moot argument if you don’t really use bookmarks to any extent. But many do. I must confess my love of the current Google Chrome bookmarks layout. A sidebar would be terribly inconvenient and much less efficient than the current system, and it is my hope that Google will not change their layout in response to this open letter. However, I would very much appreciate a return to the simple CTRL+B method of opening the bookmarks section, instead of the current CTRL+SHIFT+B. I can speak as someone who used Firefox’s bookmark sidebar every day for years. Since I switched over to Chrome for my browsing, I have found that my browsing style has changed itself to be more efficient. Such as, instead of mousing around in a bookmark sidebar, I will Ctrl+T to pop open a new tab and start typing the bookmark that I’m looking for then selecting the bookmark with arrow keys and enter. It’s way faster and Firefox actually precipitated this by releasing the Awesomebar shortly prior to the release of Chrome. If you have a bookmark collection of hundreds of items, it just makes sense to use it as your own personal search engine. And while it’s impossible to satisfy everyone, that’s why the browsers are extensible, now. If demand is high, an extension can be made for it. I and others would like Chrome to remain fast and unbloated. The part of web 2.0 democracy that is irritating is how we users demand sameness and rebuke uniqueness, people hate change, average people demand average products, design by committee, etc. See the backlash for: Facebook redesigns, Gmail’s conversation view, Gap’s logo, and Digg’s redesign. @Wayne: Just using “search” only makes sense when you know what you’re looking for, and remember it. You wouldn’t NEED to use the sidebar if you don’t like it. That’s the beauty of it. Those who like to have the ability to have an overview of their bookmarks can have it, and those who want to do it some other way simply don’t need to have it activated. It’s not an either-or situation. No one needs to “lose.” This is not about sameness, this is about usability. I’m perfectly happy with the bookmark model in Chrome. I hardly use bookmarks any more. Most the people I’ve spoken to about bookmarks say they don’t really use them any more. I don’t know why anyone would want more than a sliver of their screen taken up by bookmarks. All through the years when I used firefox, I never felt like using the side bar, and naturally I didn’t miss it in chrome either. Interesting, thanks. To generalize this — because different people may want different side-bars, and the bookmarks data and other data may fully sit in the cloud one day — perhaps there should be a general way for a webpage to lock itself to any of the four sides of the Chrome window (if the user wishes so, of course). 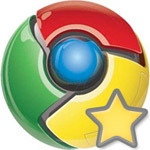 Then a developer could recreate something like the current bookmark’s Star functionality with a widget of their own added to the Chrome toolbar, but they could also create other types of services which would then sit in the sidebar. The bonus would be UI reusability, i.e. satisfying a whole lot of potential needs and ideas while not feature-cluttering and special-casing Chrome. @Pedro Dias: Interesting, but side tabs aren’t really the same thing. Like I Tweeted. That’s exactly what’s keeping me from switching from Firefox to Google Chrome. I would love to make the switch but I want to have the bookmarks on the left like in Firefox. On a big screen this is very helpfull. I don’t use the bookmark sidebar. I do use Google’s Toolbar for everything and especially for Google Bookmarks. Google Bookmarks is my most used application. I use Google Bookmarks because I need access to it from any computer. 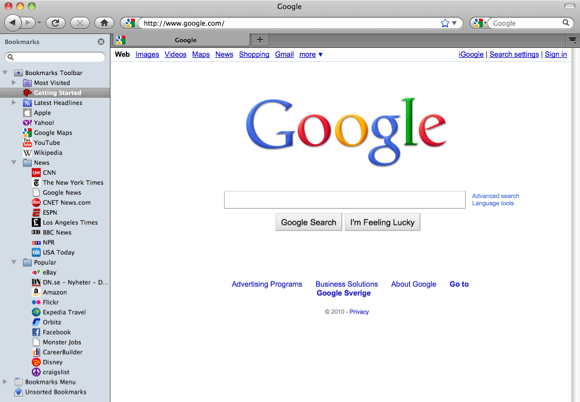 My open letter to Google Chrome would be Where the hell is the Google Toolbar? Just wanted to say that I agree. I don’t like having the bookmarks toolbar taking up my screen real estate, but would love a toolbar that could pop up when I needed it. oh yeh! its very needed!!!!!!!!!!!! Bookmarks? Whats that? I hardly used bookmarks and I dont think people will in some years anymore. There is absolutely no reason to remember a url today as you can search the name in Google and thats it. If you dont remember the name then you are not going to find it anyway in your bookmarks if you have hundreds of them. what you are looking for is an extension called neat bookmarks, which is a drop down sidebar like tree for all bookmarks. @PYDOT That just playing slow.. Why look for “Gmail” in Google, if I can click a bookmark? I have 39 bookmarks in my bar.. And in the Other Bookmarks folder over 50.. I work really fast and know where everything is, so I don’t know why mess up the current view.. I know some people like it, others don’t, but I think what @joe73112 says do the job, right? another slight flick of the wrist, and the bookmark is saved in wrong folder–and where? ?…I’ve seen some of these complaints addressed several times in other fora-and am only here searching today to see if any changes or updates have occurred. Hope soon, or I may go back to firefox after a year on Chrome–the bookmarks are growing and getting harder to handle. Thanks for any suggestions, Peg. I use bookmark a lot.. It will really make things smooth if Google just integrate Chrome Bookmark with Google Bookmark.. I mean online bookmark is the way to go.. Who needs offline bookmark anyway? I, too, miss some kind of a bookmarks sidebar. I doesn’t have to be visible all the time, only when you need it. To those who said they never need bookmarks. Well, cool for you. But as a software developer I read articles and tutorials quite a lot. And no, Google.com is not always the right tool to find these articles quickly, again. Because you need to remember the correct keywords or you will find nothing 😉 And browsing huge article lists on big sites is just a waste of time imho. Very engrossing article. I felt your blog is highly intriguing. Kudos again – I will come back.